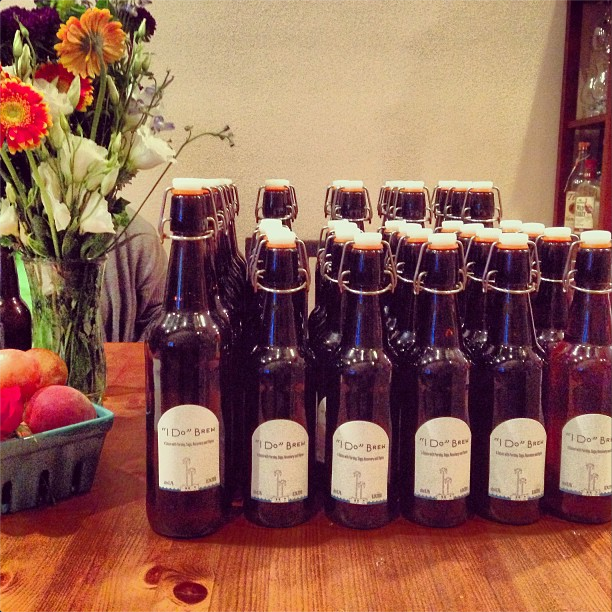 Every couple wants to infuse some personality into their big day, and for Bennett and Talia who married in August at the Adamson House in Malibu, it came bottled up in the form of homebrewed IPA and summery Saison, lovingly made at home using fresh herbs from their garden. As a Brooklyn transplant who had several guests visiting from New York, Bennett also wanted to give them a taste of life on the Westside. Festivities began with a welcoming cocktail party at Bodega, then rehearsal dinner at Upper West, and for guests who were so inclined, morning yoga on Venice Beach the day of the wedding. Since the honeymoon, Bennett and Talia have settled into married life and are still brewing hoppily ever after. With the holidays approaching and seasonal treats like gingerbread ale on our minds, we caught up with this homebrewing hubby to ask a few questions about how he got started and what he'd recommend for some beginners like us. How did you get into making your own beer at home? I was given a beer making kit (not Mr. Beer, like, a real starter kit) many years ago when I lived in a tiny apartment in NYC and used it once. A couple years after that, still in my previous incarnation as a New Yorker, a couple from Brooklyn started selling one-gallon beer making kits, much more reasonable to work with in the confines of a typical NYC apartment than the five-gallon kit I originally had. TIP: "Brooklyn Brew Shop has grown to become way successful and I've even seen their one-gallon kits at Whole Foods Venice, an awesome way to get into brewing your own beers." Anyhow, cut to my life in LA. I was still brewing the one gallon batches when I found myself in a job surrounded by beer nerds [shout out to Chris and Johan!] and I knew I needed to step up my game, so at some point after living here for a while I got another five-gallon kit and started brewing larger batches again. Fun Fact: Talia doesn't really drink beer. She can't stand carbonation. She still makes a very good brew buddy. What did you name your wedding beer? The Saison is called 'I Do' Brew, which was the winning contender after I asked a couple friends for help naming that one. Our invites were designed by Will Staehle, and I sliced them up a bit to do this label as well as a bunch of other elements from the wedding. I am a bit of a beer nerd, and beer nerds often like to drink beers that may be a bit intense … bitter, heavy, strong … for those who are used to the Buds and Heinekens of the world, so I knew that I couldn't make all the beers at the wedding completely inaccessible. Hoppy Hoppy! Oy! Oy! is a pretty approachable IPA, but may be a bit hoppy for someone who's not used to the style. I only made one batch of it (five gallons... about 48 bottles' worth) but it went over very well. I knew the other beer would have to have pretty broad appeal, and I also knew we were getting married in the late summer in Malibu, so it had to be crisp and refreshing. I was chatting with a friend who remembered this great Stone / Dogfish Head / Victory collaboration beer called Saison do BUFF. Saisons are Belgian farmhouse beers known to be refreshing and summery, just what you need after a long day of toiling on the farm... or getting hitched in Malibu. They are also often supplemented with herbs and spices, and Saison du BUFF had a little bit of parsley, sage, rosemary, and thyme in it. That made it extra tasty. Fun Fact: Bennett grew the rosemary and thyme for the batches in his garden. He also grows hops (but not enough for this batch). Stone conveniently published an adapted version of the Saison du BUFF recipe for five-gallon quantities, so I adapted that recipe to be able to work with my brewing equipment. Their published recipe was all-grain, but I don't have the gear for that... yet, and brewed up a batch in early June. A month or so later, some friends were over and we decided to have a taste of one of the bottles, and it was so good that I decided to brew another batch that was ready just in time for the wedding. There were leftovers! We had 150 people at our wedding and may have overbought on the booze front. We got nearly enough wine for every person to have an entire bottle AND about 15 gallons (about 150 bottles) of homebrew AND two other California beers; Sierra Nevada Kellerweis Hefeweizen and North Coast Brewing Scrimshaw Pilsener. You can go from brewing to carbonated bottles in about a month, though these batches took maybe 5 to 6 weeks until they were ready; maybe 10 days fermenting in what's called 'primary' fermentation, in which the yeast goes nuts and converts the delicious sugars in the pre-beer into alcohol and the unique flavors that the yeast strain you're using imparts, and then another couple of weeks in another vessel for secondary fermentation where the fermentation has slowed but the flavors have a bit more time to develop. After that, the beer was bottled and needed to wait another week or two for it to be sufficiently carbonated. A little sugar is added before bottling so the yeast produces just enough carbonation to make the beer fizzy and not to make the bottles explode. All photos provided courtesy Bennett Kolasinski.